If you have even half an ear tuned to San Diego Comic-Con, you're probably aware of the various ups and downs of the proposed convention center expansion. Once deemed a sure thing, it's been derailed by various players, including local attorney Cory Briggs who objected on several fronts, including a financing plan involving a hotel room tax. But a new development bears close attention. 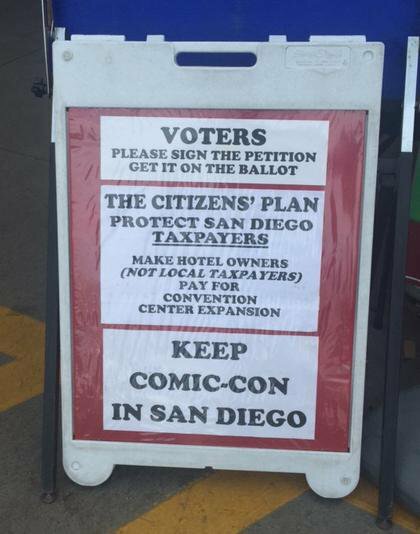 There's a new initiative collecting signatures with the heartfelt plea "Keep Comic-Con in San Diego!" It even references hotel owners. If you didn't know better, you'd think this is exactly what we - and CCI - have wanted, right? Ah, but this is an initiative authored by Cory Briggs himself. Twist! It actually is against expanding the convention center itself: "the measure specifically bars any such project on the waterfront." Not that the signature gatherers are emphasizing that part of it. Instead the campaign acknowledged today it instructed them to specifically mention the measure could keep SDCC in town. Their defense: "We've known all along that Comic-Con and the large convention center hotels prefer a contiguous expansion on the bayfront. But unfortunately, that is unlikely to happen and regardless of where the expansion goes, Comic-Con needs more space so what our signature gatherers is <sic> saying is absolutely correct." From CCI's David Glanzer: "We had no knowledge of this effort and as you can imagine, this came as a total surprise to us." CCI also said they weren't "a party to the initiative and its passing will have no effect on the organization's decision to remain in San Diego." 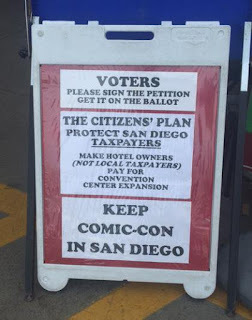 And organization Keep Comic Con in San Diego has disavowed any involvement with the petition as well. Maybe Cory Briggs will awaken on Christmas Eve to the ghosts of Comic-Con Past, Comic-Con Present and Comic-Con Yet to Come and see what a bleak future we have without a contiguous expansion. In the meantime, be careful what you sign.